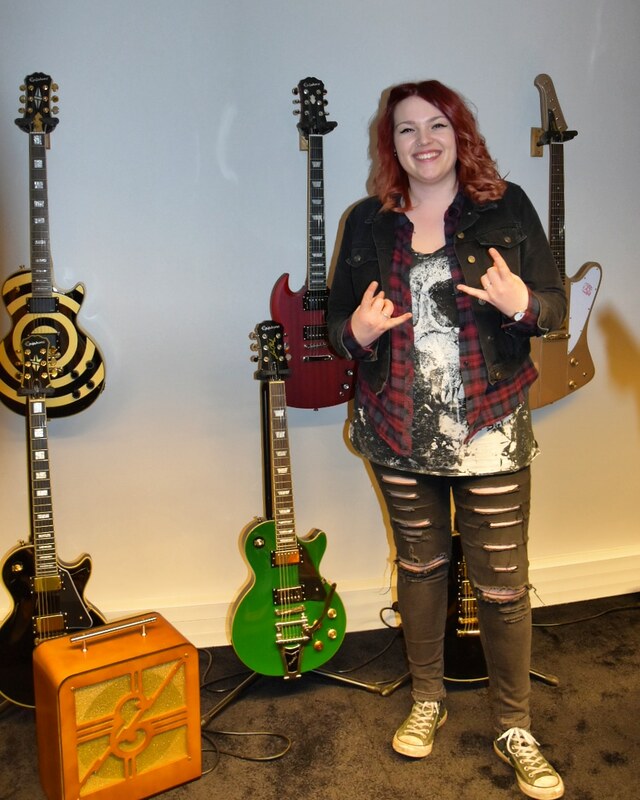 “Heavy, Melodic, Catchy”- this is how the lovely red head drummer of Stone Broken, Robyn Haycock, describes their second album, “Ain’t Always easy”, released on 2nd of March 2018 at Spinefarm Records and produced by Romesh Dodangoda (Motorhead, Bring Me the Horizon). 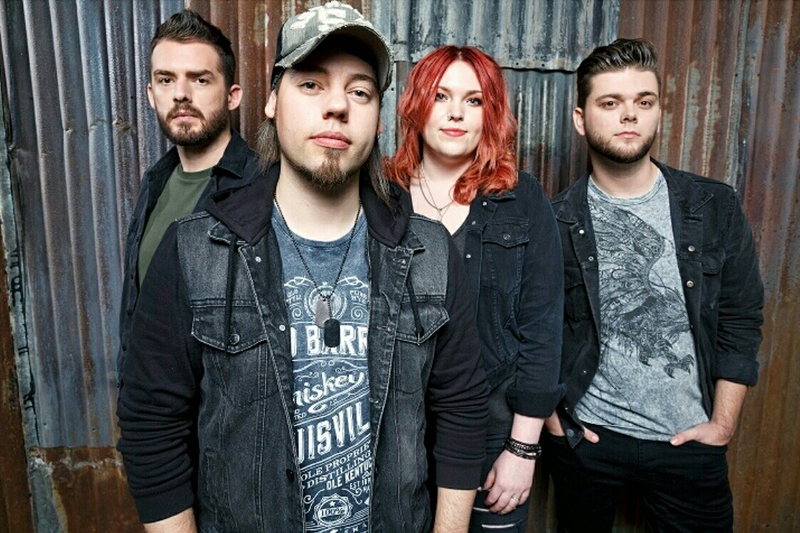 Revealed in 2014 with the self-produced EP “The Crow Flies”, the 4 – pieces British band did not waste much time and released a debut album in 2016, titled “All in Time” critically acclaimed and with singles largely played by radios like Kerrang! Radio or Planet Rock. 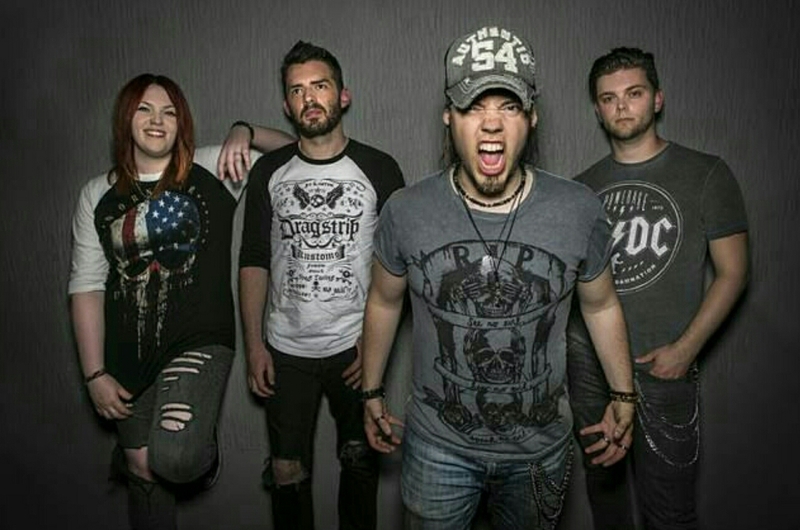 The quartet from Wallsall (Birmingham), strongly inspired by big American hard rock scene, deliver an awesome second album with crunchy guitars, ripping riffs, drums punchiness, thrumming bass lines, grit and strong vocals. A powerful sound with massive melodies, big choruses and great arenas anthems. How did you guys meet and formed Stone Broken? Robyn: Me and Rich met at college nearly 11 years ago. We were in the same music class, we were jamming together. We met Kieron in a local pub, he was serving behind the bar and he played bass and we need a bass player. We had the same age, we loved the same music, we had the same influences. He knows Chris from his previous band so…we formed Stone Broken in 2013. Robyn: When we started, we need to pay everything: new guitars, new drums, amps …we were really stone broke, we had no cash… so we thought that it’s a good name for the band. In that way, if we ever have success in the future, with this name, we know where we come from. For the moment, it’s working pretty well for you guys… already the second album in 2 years. What can you tell me about it? You say “Ain’t always easy” on the song “Home”, what was the most difficult for you as a band? Robyn: We supported some of the best bands, we played some big festivals… It wasn’t always easy, we had some lows and some highs, but we learned that you get somewhere if you work hard. You have to have the mentality and hopefully, you can get where you want to get. Let’s talk about few songs … “Home”, what can you tell me about this song? Robyn: This song was one of the last one we wrote acoustically and it is about being away from home, you know, home sickness. We were touring all last year, so we were missing home and its comfort. Robyn: We released Worth Fighting For to give fans an anticipation of what is going to come and about what they can expect: it’s about the all Stone Broken sound: the punchiness, the big melodies and big choruses. It is a song to inspire a person in what he is doing. If you believe in something, just stand up and you’re going to do it. How about you as a drummer, what is your favourite song of the album? Robyn: I think the most challenging for me to play as a drummer is Heart Beat Way. You have the swing feel and the stumping beats in it, you can properly go into chorus… it’s a great song to get into it and do some headbanging. You are doing a video also for this song? Robyn: Yes, we have recorded it beginning of February and it is in editing process. It will be release soon, can’t wait for it. Let me see it All? Robyn: When we were writing this album, we wanted a stripper song, you know, a dancing song as every rock band has …like Poor Some Sugar On Me by Def Leppard. The lyrics are about addiction. It’s quite powerful. Then personally, I was raised with Led Zeppelin, AC DC, Van Halen…Rich was born on Motown, funk, Keiron loves Whitesnake. How did you choose to play drums? Robyn: I play drums because I could not play guitar. My parents bought me a guitar first, but I had no patience for it. It was not for me. Then it was a drum kit in our school, I was 13, I took some drums lessons and I was really get into it. I think that I always had that passion for drums and it will never leave me now. Let’s talk a bit about fashion – what’s your style? Robyn: My style is definitely grunge. If it looks new it is not good. I love jean jackets, ripped jeans, jeggings, skulls. I adore skulls, I am collecting them, all sorts of rings, earrings. I love Converses and leather boots. I am pretty grungy in life and on stage. The rocker look is always stuck with me. What do you always take in your luggage? Robyn: My jean jacket, some shirts, in general comfortable things to travel. How about the stage, do you guys have a code for the outfit? Robyn: There is no code but we all wear dark jeans, we all wear pretty much converses so finally, we all have a matching in a certain way. What is the biggest advantage to be in a rock band? Robyn: If you’ve got a story to tell and you want to point a cross, this is the best way to express yourself, with music. You also gain so many friends. Fans turn into friends. It’s a real community, you receive a lot of love, you have fun and you have a good time. How about being a girl in a boys’ band? Robyn: We have a kind of running joke as Rich calls me “The Boss”. We are getting so well together. We have a great communication, we are best friends. We are going out together, we go to cinema, we go bowling, we are always together in some way. Who would be your favourite artist for a collaboration? 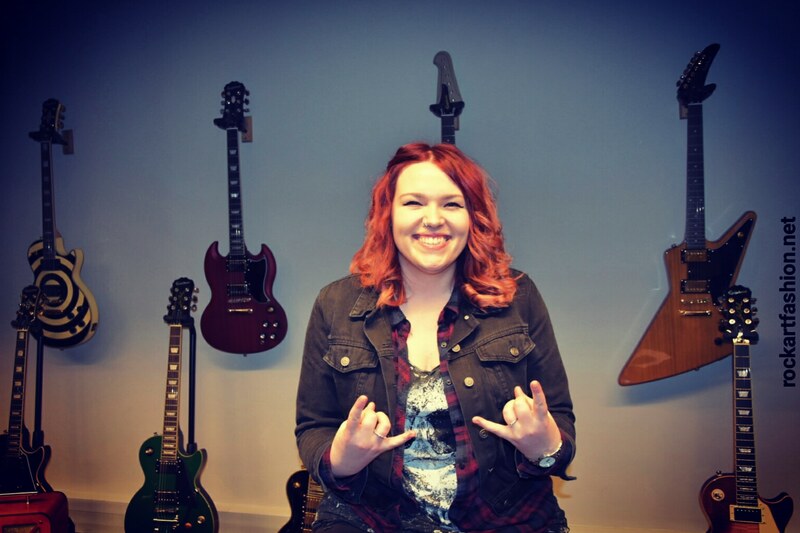 Robyn: I think someone like Black Stone Cherry or Halestorm (Lzzy) or Slash. I’ll play with anyone. I think it is important as a musician to go, explore and play with other musicians, no matter how is gonna end. Even if it is only a jam, it’s great. Robyn: I look after the Social Media for the band. We post several times per day on different medias. We have Twitter, Facebook, Instagram. We keep updated people about us. It’s another way that we can speak with our fans. We try to get back to every single comment. 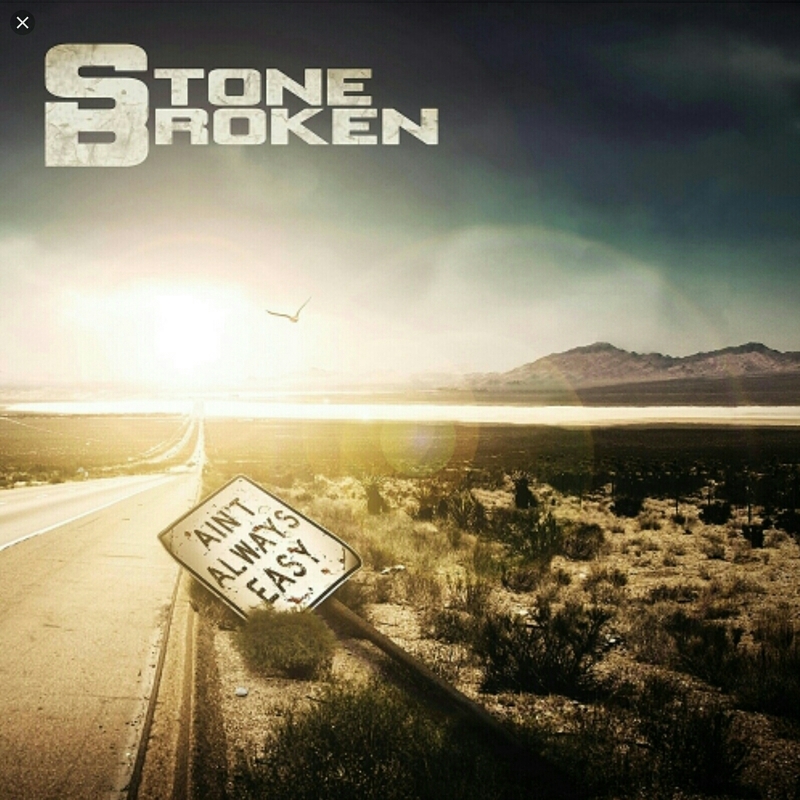 We also have a fan group on Facebook dedicated to Stone Broken, they are called the Broken Army. They talk about the band before the gigs, relationships are formed, it’s just incredible. I think it is so important these days for a band to be on social media. Robyn: I love cinema, I am a big fan of horror films and I love to enjoy music, discover other bands. My life is mainly based on music. It’s my passion. Robyn: We start on 22nd of February, we will come in France on 16th of March. It will be great to go back to Forum (in Vaureal). We already played there last year with Glenn Hugues, the crowd was really great. Rich Moss (Vocals/Guitars), Chris Davis (lead guitar/vocal), Keiron Conroy (Bass/Vocal), Robyn Haycock (drums) will play au Forum de Vaureal on 16/03/2018 with Jared James Nichols. « Heavy, mélodique, accrocheur » voilà comment la sympathique batteuse rousse de Stone Broken, Robyn Haycock, décrit leur second album, « Ain’t Always Easy », sorti le 2 mars 2018 au Spinefarm Records et produit par Romesh Dodangoda (Motorhead, Bring Me the Horizon). Révélé en 2014 avec l’EP auto-produit « The Crow Flies », le quator britannique n’a pas perdu beaucoup de temps et sort un premier album « All in Time » en 2016, acclamé par la critique, et diffusé en boucle par des médias comme Kerrang ! Radio ou Planet Rock. Le quatuor de Wallsall (Birmingham), fortement inspiré par la scène hard rock américaine, nous offrent un second excellent album avec guitares croquantes, des riffs muscles, une batterie agressive et une voix forte et puissante. Des mélodies massives, de grands refrains et des hymnes dignes de grandes arènes, Rich Moss (Chant/Guitare), Chris Davis (lead guitare/chant), Keiron Conroy (Bass/Chant), Robyn Haycock (batterie) ont les plus grandes qualités pour conquérir un bon nombre de fans passionnés et exigeants. Question classique : comment vous vous êtes rencontrés ? Robyn : Rich et moi, on s’est rencontrés au collège, il y a près de 11 ans. Nous étions dans la même classe de musique et on jouait ensemble. Ensuite, nous avons rencontré Kieron dans un pub local, il jouait de la basse, et nous avions besoin d’un bassiste. Nous avions le même âge, les mêmes goûts musicaux et influences. Il connaissait Chris de son groupe précédent et voilà, nous avons formé Stone Broken en 2013. Robyn : Comme on était au début, nous devrions tout payer : nouvelles guitares, nouvelle batterie, amplis, etc et donc la plupart de temps on était fauchés (stone -broke), sans un sou. Et on s’est dit… tiens, Stone Broken, c’est un bon nom pour le groupe. De cette façon, si jamais nous aurions du succès à l’avenir, nous savons d’où nous venons. Robyn : Ouais, pas mal…Eh bien, « Ain’t Always Easy » a été écrit en 6 semaines. On est rentré de la tournée avec Glenn Hugues et on a toute de suite commence à écrire. C’était assez stressant. Nous avons écrit l’album, puis nous sommes entrés dans le studio pour encore 3 semaines d’enregistrement. « Ain’t Always Easy » (N’est pas toujours facile) vient de la chanson Home … qu’est ce que a été le plus difficile pour vous ? Robyn : Nous avons tournés avec les meilleurs groupes, nous avons joués dans des festivals et ça n’a pas été toujours facile. Nous avons eu des hauts et des bas, mais en fin de compte, vous arrivez à quelque chose si vous travaillez dur. Vous devez avoir la mentalité et avec un peu de chance aussi, vous pouvez obtenir ce que vous voulez obtenir. Robyn : Cette chanson est l’une de dernière que nous avons écrite. On l’a écrit en acoustique et elle parle de fait d’être loin de la maison. La maison et son confort qui nous manquent pendant les tournées. Robyn : Nous avons sorti Worth Fighting For, en premier pour donner aux fans un aperçu sur l’album et à quoi ils doivent s’attendre : c’est tout sur le son de Stone Broken, le punch, les grandes mélodies et grands refrains. C’est une chanson qui doit inspirer et encourager une personne dans ce qu’elle fait. Si vous croyez en quelque chose allez-y, foncez. Robyn : Je pense que le plus grand challenge pour moi de jouer comme un batteur et Heart Beat Way. Elle a le swing, la puissance et le refrain… c’est une bonne chanson pour se défouler avec des headbanging. Vous faites une vidéo aussi pour cette chanson ? Robyn : Oui, nous l’avons enregistré début février et elle est en cours de montage. La video sortira bientôt. Robyn : On voulait une chanson qui fait danser, comme tous les groupe de rock ont… un peu comme « Pour some sugar on me » de Def Leppard. … Les paroles parlent de la dépendance. C’est une chanson puissante. Moi personnellement, j’ai grandi avec Led Zeppelin, AC DC, Van Halen… Rich est né avec la Motown, le funk, Keiron aime Whitesnake. Comment as-tu choisi de jouer de la batterie ? Robyn : J’ai commencé à jouer de la batterie car je ne pouvais pas jouer de la guitare. Mes parents m’ont acheté une guitare, mais je n’ai pas eu la patience pour apprendre. Ce n’était pas pour moi. Puis nous avons eu kit dans notre école, j’avais 13 ans… j’ai pris quelques leçons de batterie et j’ai vraiment aimé. Je pense que j’ai toujours eu cette passion pour la batterie et elle ne me quittera jamais. Parlons un peu de fashion – quel est ton style ? Robyn : Grunge. Si les vêtements semblent neufs, ce n’est pas bon. J’adore les vestes en jean, les jeans déchirés, les jeggings, les crânes. J’adore les crânes et je collectionne des bagues, de boucles d’oreilles, colliers. J’adore les bottes en cuir et les Converses. Je suis assez grungy dans la vie et sur scène. Qu’est ce que tu emportes toujours dans ta valise en tournée ? Robyn : Ma veste en jean, des chemises… en général, des trucs confortables pour voyager. Et sur scène avec les garçons vous avez un code pour s’habiller ? Robyn : Il n’y a pas de code, mais comme nous protons tous de jeans noir, des Converses et des T-shirt, finalement on est assortis d’une certaine manière. Quel est le plus grand avantage d’être dans un groupe de rock ? Robyn : Si tu as une histoire à raconter ou donner ton avis sur quelque chose, c’est la meilleure façon de t’exprimer, à travers la musique…Aussi, tu te fais beaucoup d’amis. Des fans sont devenus des amis. On a une véritable communauté de fans. On reçoit beaucoup d’amour, on s’amuse et on passe des bons moments. Robyn : Il ya une sorte de plaisanterie car Rich m’appelle « The Boss ». On s’entend très bien ensemble. On communique super bien. On est les meilleures amies, on sort ensemble au cinéma, au bowling… en quelque sorte, on est toujours ensemble. Qui serait ton artiste préféré pour une collaboration ? Robyn: Black Stone Cherry ou Halestorm (Lzzy) ou Slash. En fait, je jouerais avec n’importe qui. Je pense que c’est important pour un musicien d’aller explorer et jouer avec d’autres musiciens n’importe le résultat. Même si c’est seulement pour faire du jamming. Que penses-tu des médias sociaux ? Robyn : Je m’occupe de médias sociaux pour le groupe. On poste plusieurs fois par jour sur différents médias Twitter, Facebook, Instagram. Nous tenons au courant de fans de tout ce que nous faisons. C’est une aussi une autre façon de parler avec les fans. Nous essayons de répondre à chaque commentaire. Nous avons aussi un groupe de fans sur Facebook dédié à Stone Broken. Ils s’appellent The Broken Army. Ils parlent du groupe, des concerts…des relations, des amitiés se sont formées, c’est tout simplement incroyable. Je pense qu’il est très important pour un groupe maintenant d’être actifs sur les médias sociaux. Que fait-tu pendant ton temps libre ? Robyn : J’aime le cinéma, je suis un grand fan de films d’horreur et j’aime écouter de la musique, de découvrir d’autres groupes. Ma vie repose principalement sur la musique. C’est ma passion. Robyn : Nous commençons la tournée, le 22 février et nous viendrons en France le 16 mars 2018. Ça va être super de revenir au Forum (Vauréal). Nous avons déjà joué là-bas l’an dernier avec Glenn Hugues, la foule était vraiment géniale. Robyn : Merci à toi. Stone Broken jouera au Forum de Vauréal, le 16/03/2018, avec Jared James Nichols.